Currently deployed special purpose decision support tools (DST) for the approach traffic, known as AMANs, intend to propose optimized sequences of inbound traffic and generate guidance advisories for efficient approaches. Information about deviations from the planned sequence is exchanged between controller and pilot via radio communication. The AMAN learns about these intentions only by changes in the track of the aircraft shown to the controller on the radar screen with a delay of about 30 seconds. The planning algorithm of the AMAN is therefore not timely updated. The project AcListant shows, for a specific airport and its airspace, how to avoid this delay by analyzing the controller-pilot-communication and using the gained information as additional sensor (red arrow in the figure). The improvement of the DST is achieved by extending it with a speech recognition facility. 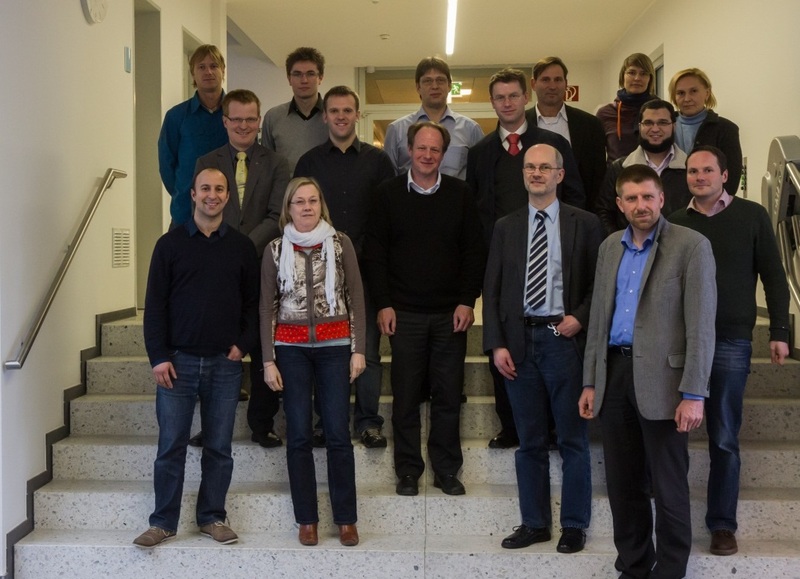 The project was divided into 5 main work packages (WP1-5) and the project management in work package WP0. The project aim is defined by achieving “recognize the controller concepts at a rate of at least 95%”. In WP1 we therefore collect and prepare speech data with support from DFS. 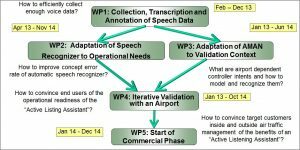 The issue of WP2 is modeling the whole used vocabulary of approach controllers in the speech recognizer while checking a sufficient word recognition rate to be achieved. For use in operational environment the speech recognizer and the approach planner as well have to be adaptable to different air space structures. This task is handled within WP2 and WP3. WP4 generates hypotheses for controller intent in several iterations. It further assigns priorities to the intent and recognizes it, so that the guidance commands generated by the AMAN are plausible to a rate of 99%. 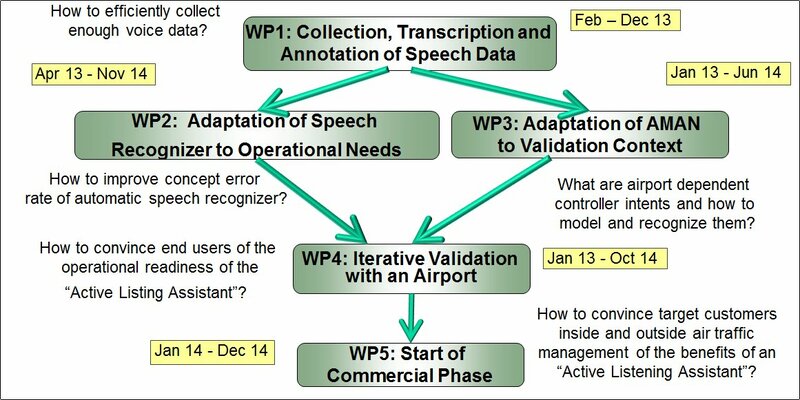 A portable demonstrator is built in WP5 aiming at showing the concept and performance of the “active listening assistant” to the potential customers. A technology transfer to far-out areas of assistance systems is possible in a similar manner, but requires contact to correspondent customers with their own reutilization ideas. It shall be realized by attending international fairs like the CeBIT in Hannover with the demonstrator. Thereby the concept can be introduced to a great amount of professionals in different disciplines. This project has received funding from the SESAR Joint Undertaking under Grant Agreement No. 698824, under European Union’s Horizon 2020 Research and Innovation programme.